The diagnostic development team in Burnet’s Global Health Diagnostics Laboratory focuses on the development of prototype rapid, point-of-care tests for infectious diseases and other priority global health conditions. 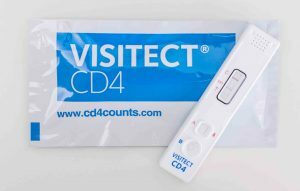 The VISITECT® CD4 point-of-care test for HIV was developed by Burnet Institute. The team’s innovations have enabled the development of products for the diagnosis of infections (hepatitis E, active syphilis), measurement of CD4 T-cells and plasma separation for HIV viral load, which have been successfully out-licensed for manufacture, as well as for liver disease ALT1) in partnership with Burnet’s spin-off company, Nanjing BioPoint Diagnostics. The team is currently working with Alfred Health to develop a point-of-care test to detect signs of severe infection that contribute to sepsis.